Narrator: In an unspecified future, one big problem is scarcity of clean air. In the background, chimneys spew out black clouds of smoke. A small truck has the words on its side: Clean Air $500/litre. A short-haired man is seen collapsing to the ground. Short-haired man: *Choke. * Need air! Can't breathe! The next panel shows a man behind a lectern and near a microphone, with both hands excitedly raised in the air. 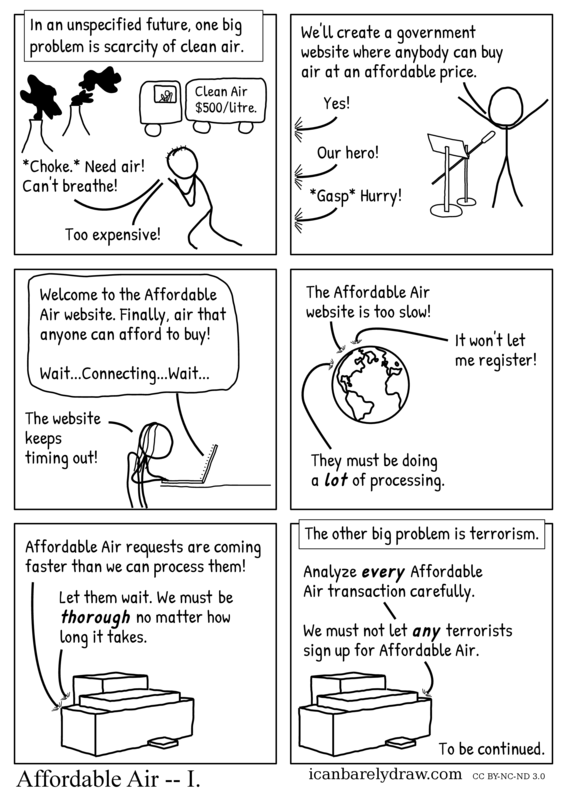 Man near microphone: We'll create a government website where anybody can buy air at an affordable price. Off-panel voice 2: Our hero! Off-panel voice 3: *Gasp* Hurry! The next panel shows a woman at a laptop computer. The laptop screen says: Welcome to the Affordable Air website. Finally, air that anyone can afford to buy! Woman: The website keeps timing out! In the next panel, the planet earth is seen as a sphere. Voice 1 from planet earth: The Affordable Air website is too slow! Voice 2 from planet earth: It won't let me register! Voice 3 from planet earth: They must be doing a lot of processing. The next panel shows a rectangular building. Voice 1 from building: Affordable Air requests are coming faster than we can process them! Voice 2 from building: Let them wait. We must be thorough no matter how long it takes. The next and final panel begins with the narrator's text. Narrator: The other big problem is terrorism. Voice from building: Analyze every Affordable Air transaction carefully. Same voice from building: We must not let any terrorists sign up for Affordable Air. Text in corner of panel: To be continued. Title: Affordable Air -- I.